The Living Barge project is visually closest to an art piece conceived in 1970 by landscape artist Robert Smithson. Smithson proposed the creation of a park on top of a barge that would circumnavigate Manhattan. This proposal, titled "Floating Island to Travel around Manhattan" was intended to play off the idea of Central Park as an island in the city. 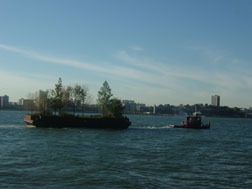 As part of a retrospective for Smithson at the Whitney Museum in 2005, Floating Island was realized - thirty years after Smithson's death. While we didn't know about Floating Island until the Living Barge Project was well underway, the Living Barge Project has, more than ever, become a tribute to Smithson and his ideas. An icon in the environmental arts movement, Smithson found the gallery and the museum to be too intertwined with an elitist, capitalist paradigm. His earthworks were not only set outdoors, but they directly related to, or commented on, their surroundings. More like the great pyramids in Egypt or Mexico than a piece of outdoor sculpture, Smithson's large earthworks are ceremonial in nature and were not meant to be bought, sold, or transported from museum to museum. Smithson also wanted to interact with new audiences in the construction and display of his work. These principles are something many artists - including Smithson - struggle with. How can we make art that is not just a commodity? How can we bring our art to a wider audience? Is it possible to use art not just as social commentary or propaganda, but something that more actively affects change? Given our own experiences in urban planning and community-based action, our approach was to take tools from these realms and integrate them with the Living Barge Project. We believe that art can respond uniquely to the community in which it is placed and can also be a platform to discuss ideas and examine particular issues in a unique forum. It creates something of which the community is proud, and increases the capabilities of those who see it to think big and envision what they want their community to be. One of the nicest photos of the Smithson barge - and an answer to a question we've been wondering for a long time. A lengthy and thorough article on Floating Island and the Smithson retrospective at the Whitney, by John Haber. Pocket Property was a 54-ton concrete island that Zittel built off the coast of Denmark. She lived on the island for several months. In this articulate, observant BOMB magazine interview, Zittel talks about this project and how it is reflective of contemporary American lifestyles. Spiral Island is Richie Sowa's labor of love, a tennis-court sized island made of a platform floating on 250,000 empty plastic soda bottles. Located in a lagoon in the resort town of Puerto Aventuras, Spiral Island is an exercise in self-contained living. Richie lives on the island with a dog and a couple of cats in a simple house with a solar oven, a toilet, and a small garden. Several mangrove trees hold the structure together and support the sand and soil. Sarah visited Spiral Island during a trip to Tulum, Mexico in 2004, shortly after she and Nicole had begun exploring concepts for what would become the Floating Barge Project. Sadly, Spiral Island was destroyed in the hurricanes along the Yucatan peninsula in the fall of 2005. Last fall, Seattle residents may remember a tropical island on Lake Washington constructed by artists John Sutton, Ben Beres and Zac Culler. In collaboration with Vital 5 Productions, the trio spent about 24 hours on the island, 'shipwrecked' in torn suits and causing traffic jams on 520 in what turned out to be a hilarious comment on civilization's messed up priorities (just read the Stranger's commentary on the media coverage, which predictably focused on the traffic).